Menigma offers enrichment services by referring to various data sources like web sourcing, manufacture/supplier contact sourcing, paper catalogs/datasheets etc. Pro global business solutions offer all types of data cleansing and enrichment services. Data quality is an under-utilized component in most business intelligence implementations. And many BI managers don't understand the real business value that data quality tools and processes offer. What is the cost of bad, inconsistent or missing data Wrong decisions. Unprofitable strategies. Wasted time and money. Outsource your data cleansing projects to us; it includes standardization, de-duplication, validation, verification, updation. 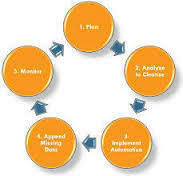 This applies to the information retrieved from data entry and processing from different sources. Data cleansing or data scrubbing is the act of detecting and correcting (or removing) corrupt or inaccurate records from a database. It involves identifying incomplete, incorrect, inaccurate, irrelevant etc. parts of the data and then replacing, modifying or deleting this bad data. After cleansing, a data set will be consistent with other similar data sets in the system. We have expertise in verifying large quantity of data for its correctness, and QC checks to segregate useful data from the lot. This helps the customers to make effective use of large amount of data available with them. We conduct different types of verification and quality control depending upon the customer needs.